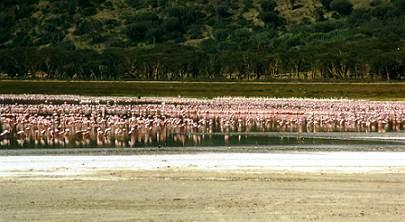 Lake Nakuru National Park is world famous for, and was created to protect its stunning flocks of lesser flamingo, which literally turn its shores pink. Its bird life is rich; a beacon for leading ornithologists, scientists and wildlife filmmakers. The park spans an attractive range of wooded and bush grassland around the lake, offering a wide ecological diversity, from lake water, woodland to rocky escarpments and ridges. The park was established in 1961 and started off very small, only encompassing the famous lake and the immediate mountainous area. It now includes a substantial part of the savannahs. It is located close to the town of Nakuru, which means 'Dust or Dusty Place' in Maa, the Maasai language. Notable game within the lake includes the hippo and clawless otters. On the shores roam waterbuck, Bohor's reedbuck and zebra. The woodlands and forest are now home to both black and white rhino. In 1987, only two black rhino remained following devastation by poachers. By creating a rhino sanctuary within the Park and reintroducing a breeding herd from Laikipia, KWS has now successfully re-established rhino in the park. Game viewing is relatively easy: buffalo, leopard, lion, rothschild's giraffe, white and black colobus monkey are in plenty. The bush lands offer eland, steinbok, impala, Chandler's reedbuck and dik dik, whilst rock hyrax and klipspringer occupy the cliffs and escarpment.